Yandex is a leading search engine in Russia having more than 60% of market share. Yandex Webmaster Tool allows you to submit your site to Yandex Search Engine. Unlike Baidu in China, Yandex provides the Webmaster Tools in both English and Russian language which makes it easier for Webmasters to submit and monitor their sites. With the increase in English searches, submitting your site to Yandex increases the possibility of attracting millions of users from Russia even though your site content is primarily in English. Similar to Google, Yandex has a single account for accessing all the features. You can register for a Yandex account here and login to Webmaster Tools account here. The English version of Yandex Webmaster Tools offer limited features compared to the Russian version. But this will help international site owners to submit their site to Yandex. Similar to most other search engines, Yandex offers the following basic features. Remember Yandex removed the anonymous site submission and you should submit your site only through webmaster tool account. Submit your site – submit your site with correct URL and verify the ownership rights to access other features. Sitemap submission – you can validate the XML Sitemap using the “Sitemap Validator” tool and submit to Yandex under “Indexing > Sitemap files” menu. Search query – check which search queries brought traffic to your site under “Search queries > Query history” section. Indexing status – check the status of indexed pages under “Indexing > Searchable pages”. You can also find the pages excluded from Yandex search along with the reason. Reindex pages – Resubmit the page URL when the content is changed to request Yandex for crawling and indexing under “Indexing > Reindex pages” section. Find internal and external links of your site under “Links” section. Set regional affiliation of your site under “Site information > Region” section. This will help Yandex to show it appropriately on local searches. 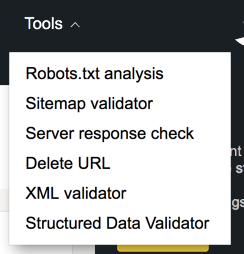 Use the free tools for validating the XML Sitemap before submitting and check the mobile friendliness of your site to take corrective actions. Analyze the search queries that shown your site in the search results. Checking the site’s status in Yandex search engine like how many pages are indexed and excluded. Mobile friendliness of your site. Check site security and diagnose the site for other possible problems. The features are categorized into different section in Yandex Webmaster Tools account. Let us check each section in details. The summary section shows all basic details of the selected site like a dashboard. You can check the site problems, search traffic, crawl errors and many other details. This section contains two parts – site diagnostics and security and violations. Diagnostics section will show you the latest problem that Yandex detects on today. Click on the ‘Other days’ button to view the historical problems on your site. Click on the link ‘View list of everything checked by webmaster’ to view the status of your site against each category of errors. You will see all error are categorized under fatal, critical, possible problems and recommendations. Ensure that the status against each type shows as ‘Everything’ Okay’. Otherwise click on the ‘Check’ button to start the checking. It may take many days for Yandex to complete the checking of the error. Security and violations section will show any security errors present on your site. Ensure that there are no security or violations so that Yandexbot can crawl and index your site in the search results. Search queries section will show you all queries, impressions and clicks for your site for the selection period of time. You can view the details filtered by countries, devices and also filter based on the position of impressions, clicks, average search results and CTR %. Yandex allows you to create groups and classify your queries so that you can filter the relevant queries based on the group. Indexing section is one of the important sections in Webmaster Tools account offering various information about the indexing status of your site in Yandex search engine. 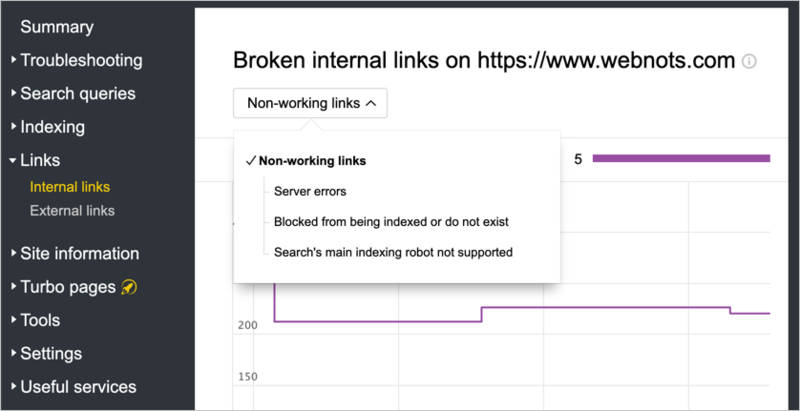 Check the crawl statistics to ensure, Yandex crawls all your new pages and also view the crawl errors indicating HTTP status code. Use ‘Check URL Status’ or ‘Important page monitoring’ tool to submit important pages on your site and track the indexing status in Yandex. Remember this is not a tool is not for crawling or indexing, this is only meant for tracking indexing changes of important pages. 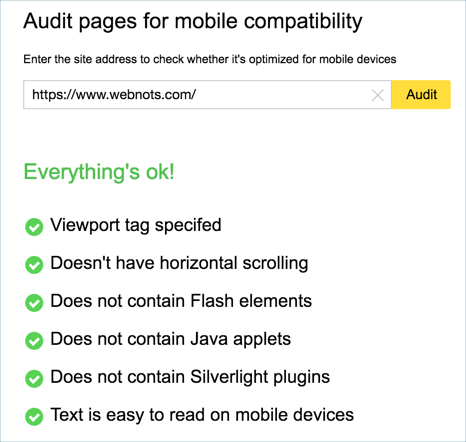 You can add up to 100 important pages from your site for monitoring. Use ‘Reindex pages’ tool to request for indexing your pages in Yandex search engine. This is similar to Fetch as Google option in Google Search Console. We have a separate article to explain how to submit XML Sitemap to Yandex. Basically, you can go to “Indexing > Sitemap files” section and submit your Sitemap. Use ‘Relocate site’ tool when you migrate your site to another domain. First you should add and verify your site ownership of the new domain in Yandex Webmaster Tools account. Then use this tool to submit the migration request to retain your search engine ranking. You can also use this tool when changing your domain with www or https. Well, we need to really mention this here that Yandexbot is one of the aggressive crawling bot. Though you will not see many indexed pages, the crawling will happen frequently. This may affect the server’s capacity or impact real users on your site. Especially you have submitted site to other search engines like Google, Bing and Baidu then you should limit the Yandexbot crawl rate manually. 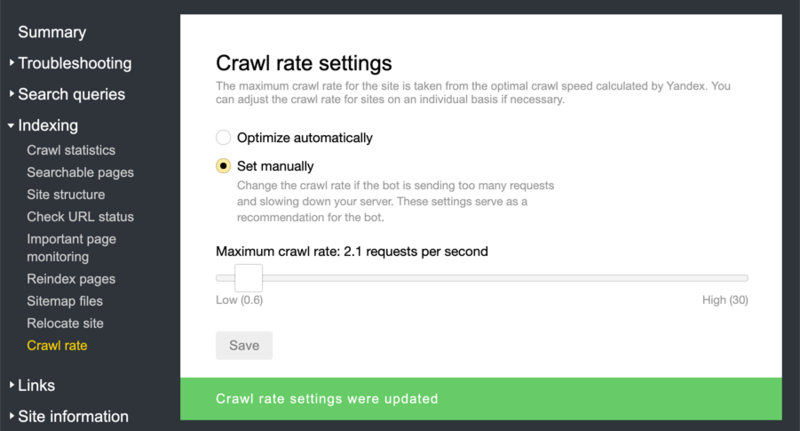 Click on the ‘Set manually’ option and choose 2 0r 3 requests per seconds to set crawl rate for Yandexbot. This will help to save lot of server bandwidth and hence save money on hosting. Learn how to adjust crawl rate for Google and Bing search bots. Internal links section will show all your site’s links having errors like 403, 500 and other types. You can easily find the broken links on your site and fix them to avoid 404 error. External links section will show the number and list of external links and sites that points to your site. This is a general indication that more number of external links will help you to get good search results. This section allows you to set geographical targeting, letter case for site name and sitelinks. Similar to all other search engines, Yandex will automatically handle the sitelinks. You can’t manually add sitelinks to your page. Letter case settings allow you to change the display of your site in Yandex search results. 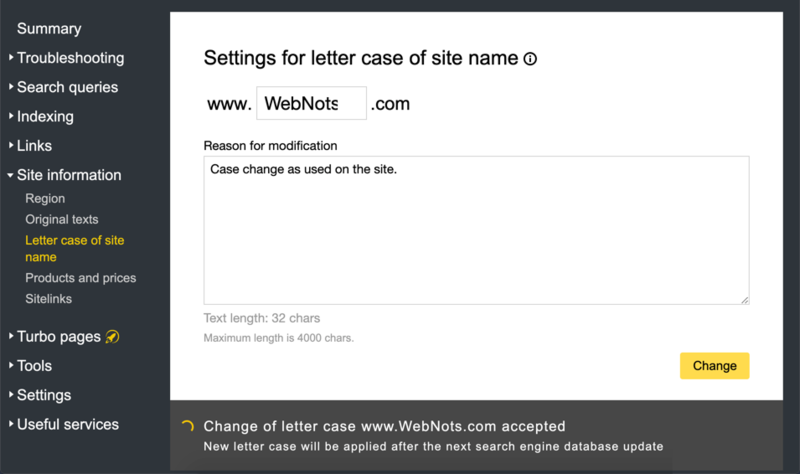 For example, you can change the site name case from ‘webnots’ to ‘WebNots’. 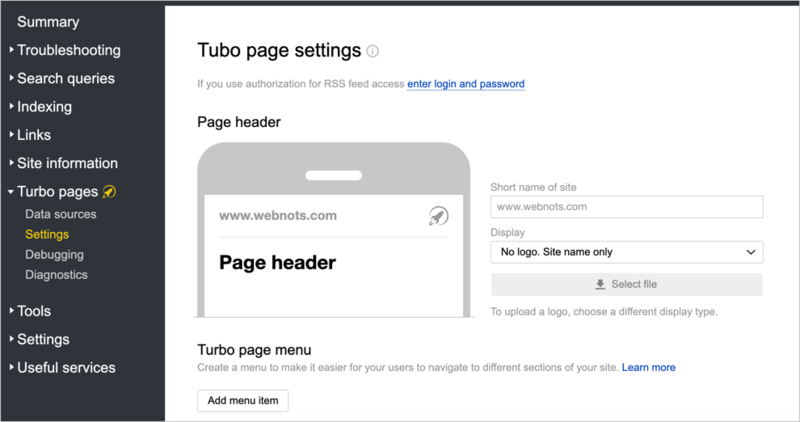 Turbo pages is similar to AMP from Google. This is to speedup the mobile version of your site. But you should configure the settings to enable and customize it. We recommend to use Google AMP instead of this option, especially if you are not in Russia. These tools are available under “Tools” menu on the top navigation and also can be accessed directly from the “Tools” dropdown menu available in top navigation bar. Settings menu contains two options – notifications and access rights. 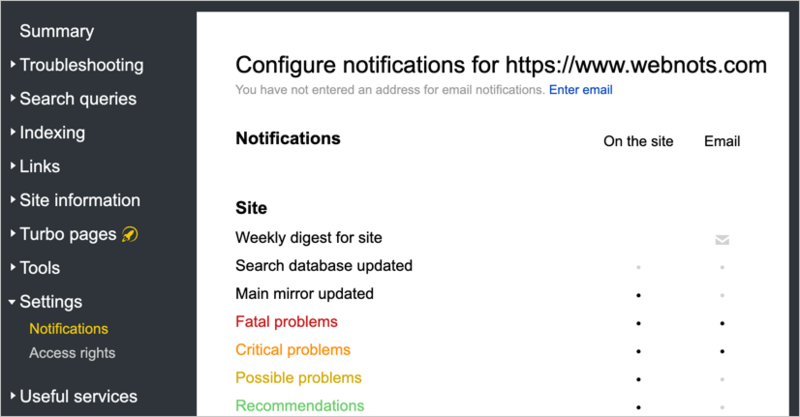 Setup how you would like to get notification for each option like receiving weekly digest and changes on your site’s statuses. Access rights section will show you the currently verified owners of the site along with verification code. You can reset the access and delegate to any owner from this section. These are additional services from Yandex like Yandex Business Directory, Live chats for business, Yandex email for domain, etc. Generally you may not any of these services for an international site. We hope you got an overview of the Yandex Webmaster Tools in this article. It is very similar to Google Search Console or Bing Webmaster Tools account. But it is difficult for English sites to drive large amount of traffic from Yandex search engine.